Do you agree with Nicky Morgan, that the art subjects are valued within an English Baccalaureate curriculum? Do we think these subjects (English, maths, sciences, history or geography and a language) give students the flexibility and choice, later on in life? More importantly, do we agree with Nicky Morgan MP, that academic subjects were ‘not viewed by schools to be for the most disadvantaged students’ because it was easier to pass a less demanding course? Best Possible Start in Life? On the 16th June 2015, Education Minister Nicky Morgan discussed changes to the English Baccalaureate (EBacc) in this press release. In this blog, I capture the highlights for all busy teachers to read in less than 3 minutes. Why not share this summary with your leadership team? These are the highlights I have extracted and what I hope, offer no political bias/rhetoric. That every child has the chance to study the EBacc subjects; English, maths, sciences, history or geography and a language at GCSE. An aim, that all pupils starting year 7 this September to study the EBacc subjects when they reach their GCSEs. The grading system we’ll use for the new GCSEs that start being taught this September; the old system of A* to U with a new scale of 9 to 1. That the ‘good pass’ will be set at a grade 5. That’s at the top of the current grade C and the bottom of the current grade B.
Low-level disruption, especially when it’s happening daily, can be just as damaging. The DfE want to support teachers to manage this low-level disruption. @TomBennett71 has agreed to chair a working group to look at behaviour content in training for new teachers building on the best evidence about what works to help them manage classrooms and manage behaviour. I hope this helps provide a snapshot for every busy teacher. Why not share this with your colleagues, especially your leadership team. What do you think? Tweet it? Does this mean an end to btec? This is so disingenuous. 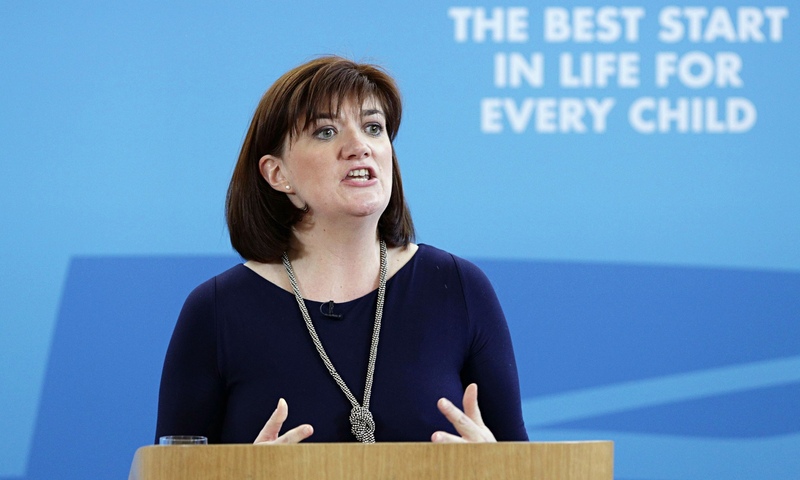 Nicky Morgan is either coasting, requiring improvement or inadequate. Of course arts subjects will be valued less highly as long as the EBacc subjects drive the league tables. Schools will pour resources into these subjects at the expense of everything else, as their reputations and the livelihoods of their staff will ultimately depend on them. And with Grade 5 being the new Grade C, you can see the focus shifting to the 4/5 boundary at the expense of the 8s and 9s. As Einstein once said, insanity is doing the same thing over and over again and expecting different results. This is the educational equivalent of calling Windscale Sellafield – a bright shiny new name, but the same old toxic crap. There will be less flexibility, not more, as the curriculum narrows to accommodate EBacc subjects.The whole thing is based on selective interpretation of flaky evidence, anecdote and personal prejudice. IN addition it will be assessed by a system which has been thoroughly undermined by Gove’s manic, ill-informed and prejudiced tinkering. What can possibly go wrong? I’m in no way arguing against the subjects themselves, but I object to the way that they have been perverted into some form of ideological crusade. And if anybody is happy with the thought that Nicky Morgan will ultimately be deciding the outcome of your OFSTED inspection, then it’s time to find something else to do. This is a car crash waiting to happen. Hi Ross The ‘good pass’ will be set at a grade 5 for Year 7 starting in September 2015. Year 8,9 and 10 (En/Ma) will be a grade 4.